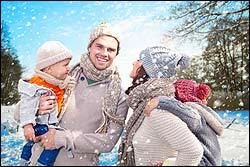 January 2013: Tips, eNews & More! We hope you had a wonderful holiday season and were able to enjoy some time with family and friends. Is quitting smoking on your list of 'to-dos' for 2013? National Non Smoking week is January 20-26. If you have tried in the past to quit or are looking for options to ensure your best chances of success, please speak to us. We may be able to help you! Once you've quit smoking we can help you make smoking a distant memory. Removing tobacco stains and working to reverse damage done to your gums and soft tissue will restore your smiles health and beauty. Thank you to everyone who completed our online survey last month. Many of your suggestions will be incorporated into our office over the New Year. Those who filled out our survey were entered in a draw to win some of our great prizes. 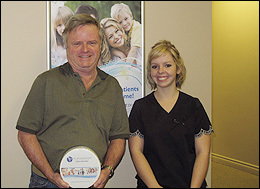 Lorne won the gourmet truffles and our Hygienist- Jessica presented the prize. 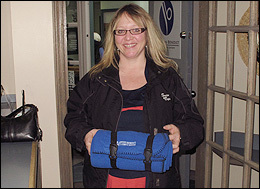 Barbara won the Port Hope Dental blanket! Stay warm! 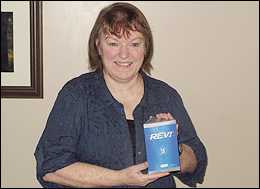 Iris won the early bird prize of a REV teeth whitening kit. Between November 1st - December 11th, our team held a food drive to benefit the Northumberland Fare Share Food Bank. Port Hope Dental and Northumberland Fare Share Food Bank would like to thank our staff, patients and the Port Hope Pharmacy for contributing to our annual food drive. Dr. Benedict and his team shared a wonderful Christmas dinner held at the Keg on December 11, 2012. The team is still raving about the delicious meal and wonderful time we all had. Click here to see some fun photos! More than 40 percent of children have tooth decay by the time they reach kindergarten. This statistic is alarming! You've worked hard to take care of your child, from changing diapers to late night doctor visits; wouldn't it be nice to have someone else sharing some of the load not to worry about tooth decay? Your child's oral health care should start early! Our office will tell you what to expect during your child's first dental visit. To prepare your child for their first visit you need to let them know what to expect so they won't be surprised or startled. The key is to be patient and remain calm. This way your child won't react to your anxiety. What we will do: Click here to find out! During our team potluck, we really enjoyed Nancy's bean salad! She was kind enough to lend us her recipe and share it with all of you! 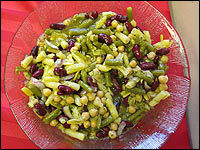 For a delicious and nutritious addition to any meal, try Nancy's bean salad and let us know what you think!